Robots, driverless cars, chatbots, face and voice recognition. All are applications of artificial intelligence and machine learning that are sweeping just about every industry these days. The possibilities are truly exciting. AI can amplify human capabilities and turn exponentially growing data into insight, action, and value, helping companies develop innovative customer experiences and a new competitive edge. As an enterprise leader, you may be wondering how to apply artificial intelligence in your own environment to your unique business needs. After all, AI initiatives, like any enterprise investment, demand business-aligned use cases. Understanding what challenges to address and proving success with a focused first project are the keys to achieving business value. This one-day visual and interactive workshop brings together your key data, IT and business stakeholders to help you find your best use cases in artificial intelligence, machine learning, big data and analytics. We help you create a high-level plan specific to your needs, including a proof-of-value recommendation for your select use case so you can move to the experimentation stage with your own data. The Workshop is ideal for organizations that have a basic understanding of AI/ML concepts, intend to start a project in the next six months, and are looking for the expertise to get started. 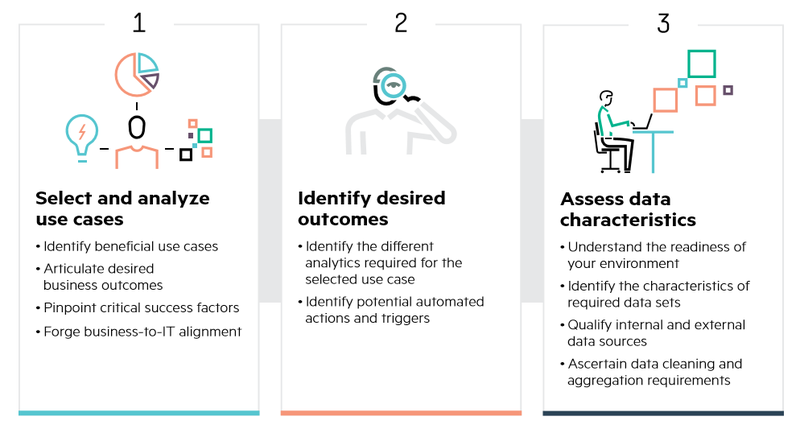 With a simple 3-step approach – see the graphic below – our HPE Pointnext experts help you align your teams and start your AI project fast. One AI use case that has found wide acceptance across a range of industries is the digitization of asset maintenance, using data from sensors to gauge performance and predict failures in industrial equipment. Currently, analytics for asset maintenance confronts three main challenges: lack of capabilities to collect and handle different data sources; lack of user confidence in predictive maintenance technologies; and difficulties around integrating analytics into the overall maintenance process. Covers all business data sources, including real-time and batch data streaming from IoT devices and data centers. Integrates analytics and AI (including machine learning and deep learning). Supports supervised learning (for failure prediction) and unsupervised learning (for anomaly detection). Secures user confidence by delivering proof-of-value capabilities, a reference architecture, open models, and training. Operates at the Edge and/or the data center. Artificial intelligence, big data, and analytics initiatives are all related, and they can power all areas of the digital transformation, from hybrid IT to the Edge. As AI continues to evolve, nobody is better positioned than HPE Pointnext to help you choose the right projects and navigate this fast-changing field. Watch this video to learn more about our three step approach to Artificial Intelligence, Data and Analytics.